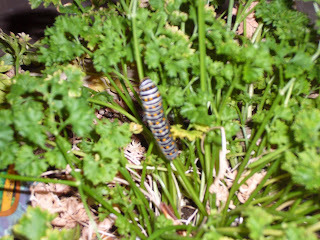 We found a new tenant in the parsley plant the other day. He isn't paying rent - but rather than evict him, the kids decided to chronicle his journey from parsley eating caterpillar to beautiful butterfly. He has doubled in size since we first spotted him just a few days ago. We'll post live updates as they happen! !